Boy of Summer: Press Release and Yankees DVD Give-Away!!! A&E Home Video has asked me to announce the impending release of a series of vintage World Series DVD sets, and as part of their promotion, they have given me five of these sets to give away to you! NEW YORK, NY, July 2, 2006 -- A&E Home Video and Major League Baseball® present a new collection of DVDs featuring the finest moments in Fall Classic® history. Equally appealing to both the die-hard and casual fan, each set showcases the team’s World Championship seasons highlights, bringing together all of the greatest plays of the teams’ World Series wins. These new collections include, for the first time, all of the unique World Series® Films for each teams winning year since 1943. Eye-catching packaging and team-specific content has never before been assembled in such definitive anthologies. Remarkable, authentic, and charged with history and super stars, these official DVDs are attractive and affordable collectibles – the ultimate in sports memorabilia! 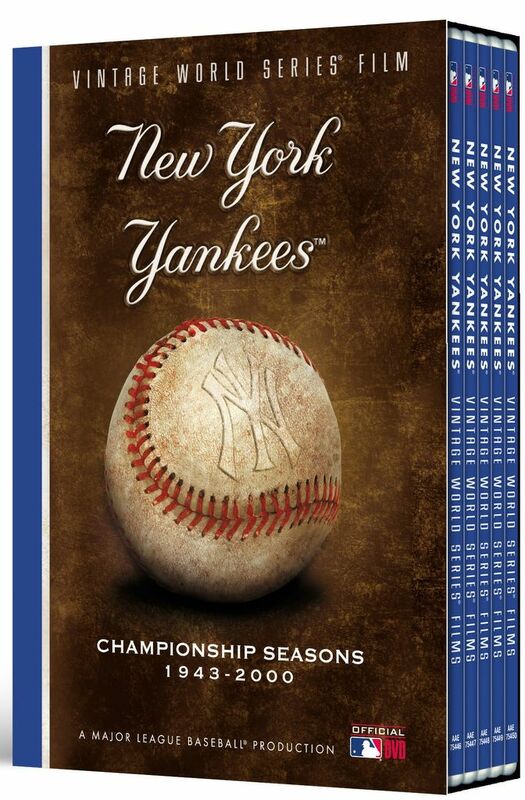 All the glory and timeless moments from 17 New York Yankees® World Series® Championships are digitally preserved on this one-of-a-kind, five-DVD collection featuring the finest moments and memories from 1943, 1947, 1949, 1950, 1951, 1952, 1953, 1956, 1958, 1961, 1962, 1977, 1978, 1996, 1998, 1999 & 2000. No other team in Major League Baseball history has had such an unparalleled record as the New York Yankees. In these remarkable 17 World Series films the legendary Bronx Bombers® create an unmatched championship legacy for the ages. The Fall Classic® films in this collection includes, the Yankees five titles in a row (1949-1953); dynasties with Joe DiMaggio, Mickey Mantle, Thurman Munson, and Reggie Jackson and the four titles in five season by Joe Torre and Derek Jeter. Spanning both three decades and three managers - Hank Bauer, Earl Weaver, and Joe Altobelli - the enduring, common trait of the Baltimore Orioles® success was stellar pitching, well-timed power, and peerless defense. The arrival of Frank Robinson in 1966 catapulted the Orioles to their first Fall Classic®. Baltimore’s pitchers dominated, holding the Los Angeles Dodgers® to just two runs – for the entire four-game World Series. Four Octobers later, the Birds power hitting and fielding were on display. The rally-ending defense of Brooks Robinson and the club’s 10 home runs in five games helped the O’s to a second Championship. In 1983, the familiar formula and a familiar face held an encore. The Orioles staff, including Jim Palmer who provided a bridge to the 1966 victors, stifled the Philadelphia Phillies® allowing only seven runs in the five games. All the glory and classic moments of these three Orioles World Series Championships are now digitally preserved on this official DVD. The passion and excitement of Los Angeles Dodgers baseball was on full display in the first three Fall Classic® games in 1959. Each record-setting crowd at The Los Angeles Memorial Coliseum swelled beyond 90,000, and a tradition of October Baseball in Los Angeles was born. In 1963, Sandy Koufax set the World Series strikeout record of fifteen in Game One. Again in 1965, pitching was supreme, but this time the Dodgers’ speed charged the offense as well. And, in the 1981 and 1988 World Series championships’ the team was fueled by the optimism of manager Tommy Lasorda. All the glory and classic moments of the Los Angeles Dodgers World Series Championships from 1959 to 1988 are digitally preserved in this one-of-a-kind two-disc DVD collection. The champion Minnesota Twins® of 1987 and 1991 were recognized for their charisma and fun-loving personalities as much as their relentless, opportunistic style of play. The1987 World Series® was the first to be played indoors and the raucous Twins® fans did everything they could to blow the roof right off the Metrodome. Record-books will note this Fall Classic for Kent Hrbek’s Game 6 grand slam, while Twins fans will never forget the thunderous, homer-hanky waving crowds that propelled them to a record-setting four home victories. 1991 was even more remarkable. Considered to be one of, if not the greatest World Series, the Twins battled through seven extraordinary games. Kirby Puckett’s stellar Game 6 including his game-winning, 12th-inning home run was matched the next night by a game for the ages, as the Twins captured their second championship with a Game 7, 1-0, 10-inning victory from Jack Morris. of James “Dusty” Rhodes. Stunned and defeated, the Indians could not overcome the stellar pitching and patient hitting of the Giants who swept all four games to claim the championship. All the glory and classic moments of the New York Giants 1954 World Series Championship are digitally preserved on this official DVD. This DVD features the official World Series® films of the A’s® World Championships from 1972, 1973, 1974, and 1989. Catfish Hunter’s pitching led the way in 1972 against the Reds when six of the seven games were decided by one run. The 1974 Fall Classic® versus the Dodgers® featured the hitting of Joe Rudi and Bert Campaneris, and pitcher Ken Holtzman’s timely home run that sealed the A’s third title in a row and place in history. Fifteen year later the A’s met the San Francisco Giants® in a historic World Series. After the A’s won the first two games, Game Three was delayed ten days by an earthquake that left sixty-seven people dead and rolled destruction across sections of the Bay Area. After much consideration, the World Series continued with Oakland sweeping all four games. All the glory and classic moments of the Oakland A’s World Series Championships from 1972 to 1989 are digitally preserved in this one-of-a-kind two-disc DVD collection. A&E Home Video, part of the Consumer Products Division of A&E Television Networks (AETN) is a video distributor of non-theatrical programming, featuring collectible DVD editions of the high quality programming from A&E Network and The History Channel, as well as acquired classic programming. A&E Home Video brings the best of critically acclaimed entertainment presented in award-winning packaging to the special interest category. For more information about ordering these and other titles from the A&E Home Video Collection, call (212) 206-8600 (TRADE ONLY). Consumers please call 1-800-423-1212 (A&E). In addition to placing orders by phone, A&E Home Video products may be purchased over the World Wide Web at ShopAETV.com. Major League Baseball Productions is the Emmy® award-winning television and video production division of Major League Baseball. With unparalleled access to the game and its players, Major League Baseball Productions produces original programming for growing audiences worldwide through its network specials, exclusive home videos, commercials and other specialty programming. New Video Group Inc. is an entertainment, marketing, and sales company specializing in bringing classic television, feature films, quality children's programming, and documentaries to home video and DVD. Since 1993, the company has grown to become one of the leading non-studio DVD distributors, reaching retail, rental, direct to consumer, as well as library and educational markets. New Video is the exclusive marketer and distributor for A&E Home Video and the exclusive retail distributor for the Scholastic Video Collection, an acclaimed line of classic children's titles on DVD from Scholastic Entertainment. New Video also operates Docurama, a five-year-old home entertainment label dedicated exclusively to bringing critically acclaimed and cutting-edge documentary films to the home entertainment marketplace. Its youngest label, New Video NYC, brings to DVD an edgy, eclectic blend of indie gems and classic cult television. The New Video Group website is www.newvideo.com.